I made Chinese potstickers at home. Potsticker has been my favourite as I love starchy food since I was in my teens. When my reader, Tony, first mentioned about potsticker, I was forthrightly asking if this is a new food as the image of “potsticker” did not came into my mind so quickly (laughing). Yes, it is the Chinese pan-fried dumpling, in Chinese, we called it “Jiaozi” (饺子), or call it “Guo Tie” （锅贴）, to be more exact and as direct translation of potsticker. They are called Gyoza, in Japanese, too. The mention of potstickers fetched me with the idea of making my own “guo tie” from scratch, where I saw the making only once in my teenage when my grandma made it for the big family on occasion. Unless you are able to get the real “guo tie” wrapper which comes in thicker sheet, I’ll prefer to make my own potsticker skin/ wrapper as the off-the-shell kinds are normally very thin sheets which meant more for the soup dumpling (水饺) or wanton (云饨) instead. Making your own wrapper which you may adjust the thickness of wrapper to your preference, at the same time, making more interesting bites with the texture you want rather than those pre-made dumpling/ wanton wrappers which usually become too smooth and soft after cooked. *Mix them together in a dipping saucer. 1) To season filling: In a medium bowl, add minced pork meat, and mix with the listed seasonings. Marinate the mixture for at least 30 minutes in refrigerator (overnight marination yields even better taste. Forgo adding of salt to avoid too briny taste if overnight). Add chives into the minced meat mixture only when you are ready to fill the potsticker wrappers. 2) To form dough for wrappers: Combine plain flour, egg, salt and water in a large mixing bowl. Use chopsticks/ fork to mix them well. If the mixture appears too dry, add some water (by teaspoon, with a maximum of 2 – 3 teaspoons) gradually until all ingredients become lumpy. When dough is almost formed, use bare hand to knead it on lightly floured table top (surface) or in the mixing bowl. Dough should be kneaded till pliable and not sticking your hands. 3) To make into potsticker wrappers: Divide dough to make into small balls, about 20 cents big each. Flatten each ball into palm-sized sheet of 0.2 – 0.3mm thick (thickness of each resembles 2 sheets of 80 – 100gsm papers) using wooden roller. Wrapper has to be shaped round. Remember to dust each wrapper (both surface) with generous amount of flour before stacking up each wrapper. Otherwise, complete the process of filling it up and make into potsticker each one by one. 4) To fill and pleat the wrapper (of potstickers): Keep your hands dry and coat with some flour, especially finger tips. Lay 1 potsticker wrapper on your palm, scope 1 heaping spoon of filling onto wrapper. Fold wrapper by half into semi circle, and slightly bend it sideway to form crescent shape. Damp your index finger (forefinger) with clean water and apply along inner edge of wrapper. Then, use thumb and index finger to pleat only the outer layer (convex layer), making about 4 – 5 pleats. Lightly press the pleats against the dampened inner layer to seal the opening. After the pleating, place the filled potsticker on a large tray lined with kitchen towel and lightly press it to flatten bottom. Repeat step until all wrappers are done. 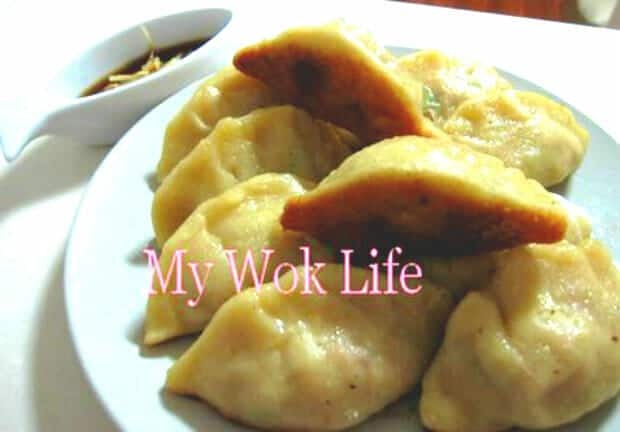 5) To cook: Heat non-stick skillet/ large pan, or even wok (which comes with its fitting lid to be used later) with oil over medium-high fire, place 6 – 8 pot stickers (depends on the size of your skillet/ pan), flat-side down, on the skillet. Reduce heat to low fire when pan frying, for about 2 minutes or until lightly crisped and browned. Do not over-crowd the skillet and make sure they are slightly apart from each other. Get ready a lid and a cup filled with 3 tablespoons of water, pour water into the skillet from the side in circular motion, and immediately cover with lid. Steam from water will disperse to perform steaming effect. Let it cook for about 1 – 2 minutes, or until water has evaporated. Repeat the steaming effect by adding another round of water and cover with lid again, if water dries up too quickly before the potstickers are completely cooked. You may repeat the steaming up to 3 times. The skin of pot stickers should be slightly translucent when it’s done. Remove from skillet, and serve with dipping sauce. There is absolutely a specific purpose to dip potsticker with ginger and black vinegar. 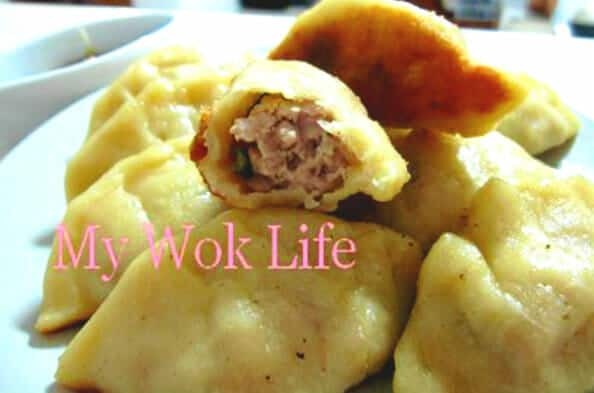 The combination yields pleasant vinegary taste which helps to get rid of the extensive meaty flavour of potsticker. The aroma of black vinegar spurs your appetite, too. Trust me, there is no other dipping better than such combination. A serving of 6 potstickers counts about 280kcal. Tips: Lay a sheet of kitchen towel or flour the tray before placing the filled potstickers to avoid stickiness. You may also dust some flour on the potstickers and cover it with another sheet of kitchen towel (before ready to cook it) to prevent pot stickers from drying out. * Perform the steaming step with low frame and do watch out the liquid from drying up to avoid burning of the bottom of potstickers. * If too much water was poured during first time and potstickers are already cooked, just open the lid and let the remaining liquid dries up in minutes. It should not affect the taste. * Chives (韭菜) are NOT scallion/ spring onion (青葱). Chinese potstickers are best to make with chives instead. Chive has high nutritional values, and it’s known as ‘male’ food, too (smile). The recipe I have been looking for, wrappers made from scratch!